On the Kyran Lynn we usually fish for the most popular and most common species in the Bay and that also includes the best tasting fish. The best fishing begins in mid- April when striper season begins. There isn't much else this time of year as the water is still just to chilly. Most fish in the Bay won't start biting until the water warms. The weather will warm up as spring turns to summer when you will see more and more species come into the Bay. The general fishing season for the Chesapeake Bay runs from April to November. 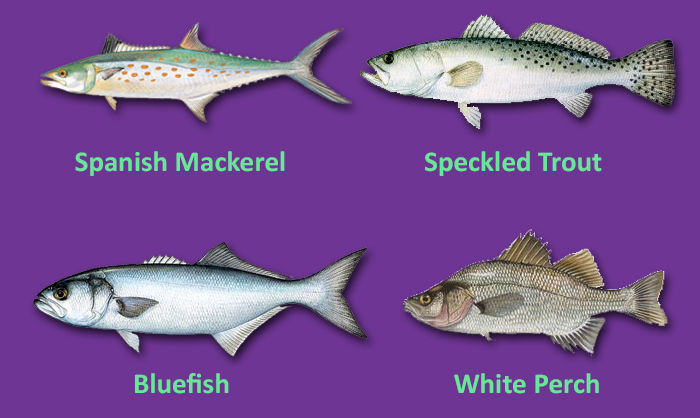 Listed below are some of the more common species we catch around Chesapeake Beach and the middle Chesapeake Bay region. Chesapeake Bay rockfish, also known as striper -- Subject to Restrictions - The Spring Trophy Season begins mid-April and goes to mid-May. It is not uncommon to catch fish over 40" during this season. During the Summer and Fall seasons you are allowed two Striped Bass over 18" per person. Big Striped Bass can also be caught in late October through November. SIZE: Averages 10 pounds - Some fish over forty pounds have been caught. 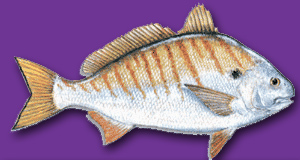 FOOD VALUE: One of the most popular fish of the Chesapeake Bay, with white fluffy meat. GAME QUALITIES: Great fun on light tackle. TACKLE AND BAITS: Usually caught casting small artificial baits or trolling large lures at different heights of the water column. MORE INFORMATION: All coastal inshore and Chesapeake Bay waters (tidal waters) have school-size fish; Chesapeake Bay tributary rivers, Eastern Shore bayside creeks south to the Chesapeake Bay Bridge Tunnel have best concentrations of fish. Norfolk Spot -- June to October - Spot usually appear in all areas of the Chesapeake Bay in the late spring and will hang around in the surf, bays and inlets until fall when the water starts to cool during October at which time they will make a run to warmer deeper water for the winter. SIZE: Averages 6-8 inches; Sometimes will grow to over a pound..
FOOD VALUE: One of the most popular pan fish. GAME QUALITIES: Spirited pan fish. Great fishing fun for the kids and family. TACKLE AND BAITS: Light spinning tackle, small hooks, bloodworms, pieces of cut fish, squid or shrimp. FISHING STYLE: Bottom fishing, either drifting or anchored. MORE INFORMATION: Caught bottom fishing with bait, anchored or drifting from boats, also caught from docks, piers, shore and surf; big runs of fish in the fall in lower Chesapeake Bay and in surf and piers of Virginia Beach. 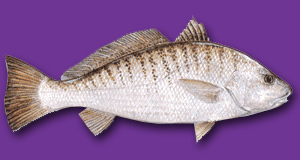 Croaker -- May to November - Croaker usually run hand in hand or fin and fin that is with spot. Usually if you are catching croaker you will most like catch spot too. Croaker usually appear in all areas of the Chesapeake Bay in the late spring and will hang around in the surf, bays and inlets until fall when the water starts to cool around October at which time the bite will slow down. SIZE: Averages a pound or less, but sometimes reach super sizes of 3 pounds or more. FOOD VALUE: Croaker make good pan fish. GAME QUALITIES: Very scrappy fighter. A large croaker can be a real fun fight. TACKLE AND BAITS: A blast to catch on light tackle. Can be caught on bloodworms, squid strips, cut bait, and even a small jig. FISHING STYLE: Drifting, anchored, bottom fishing. Trout -- May to November - Gray trout, also called weakfish, become active in the Chesapeake Bay around the month of May and will not leave until as late as November. They range from pan size to larger than 10 pounds (rare) . SIZE: Averages around a pound or two for bottom fishers but can reach sizes over 10 pounds, especially for wire liners or live baiters. FOOD VALUE: Very good, larger trout can be filleted. GAME QUALITIES: Not really a brawler but the larger trout can put up a decent fight straight down. Care must be taken when fighting and landing gray trout because they have a very soft mouth. TACKLE AND BAITS: Wide range of baits can be used for gray trout. Squid, peeler crabs, shrimp, live spot or other live bait, artificial lures. FISHING STYLE: Drifting or anchored up for the smaller gray trout, trolling along structure for large gray trout.